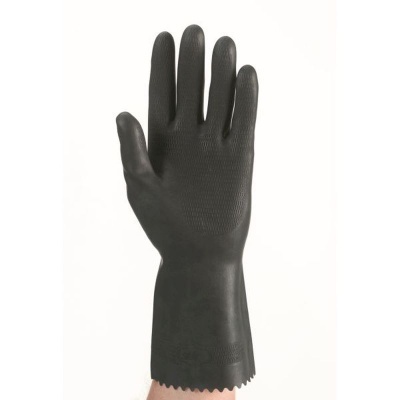 The Polyco Maxima Heavy Duty Rubber Gloves 514 provide excellent resistance against a range of chemicals. Their tough resilient material protects the user against abrasions and tears, while the glove has been specially designed to reduce hand fatigue through their anatomical design. 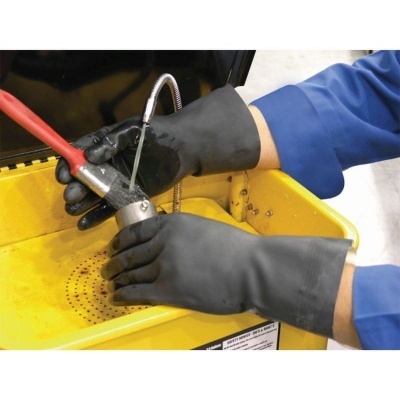 Ideal for chemical use and janitorial work, the Maxima Gloves are a great choice for all jobs that involve coming into contact with hazardous or corrosive materials. Hydrochloric Acid 10% >480 mins. Sodium Hydroxide 40% >120 mins. The Maxima Heavy Duty Rubber Gloves are available in four sizes that should suit the hands of most users. Please measure the circumference of your hand around the knuckles (excluding the thumb) with your hand open and your fingers together, and the length of your hand from the tip of your middle finger to your wrist.